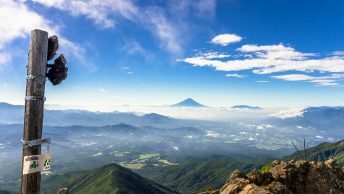 Along with claiming the title of Japan’s second highest peak, Kita-dake is blessed with superb panoramic views. Most hikers complete the hike in two days but if you’re not in rush, I recommend taking your time and splitting it over three days. The best months for climbing Kita-dake are July and August as there are many alpine flowers. September and October can be good if you go prepared for colder conditions. Buses from Kofu Station to Hirogawara run from late June until the first weekend of November. Getting to the trailhead takes a little time and planning. First, you’ll need to get to Kofu Station 甲府駅 about 90 minutes by limited express train from Shinjuku then pick up a Yamanashi Kotsu bus from the south exit (bus stand no.1). During the busy season from mid-July through August 20 there are seven daily buses starting at 4:35am! In fact, some hikers catch the last train to Kofu the night before and sleep in the terminal building waiting to snag this bus. The bus ride to Hirogawara 広河原 takes around 2 hours and costs 2,050-yen one way. Aim for a bus no later than 9:05am to give yourself enough time to reach the first night’s campsite at Kata-no-koya. After getting off the bus walk up the road and look for a suspension bridge which crosses the Noro River. The trailhead proper starts adjacent to the Hirogawara sansou 広河原山荘. Incidentally there is a campsite and waterhole here which is handy if you’re looking to depart early on the final day. 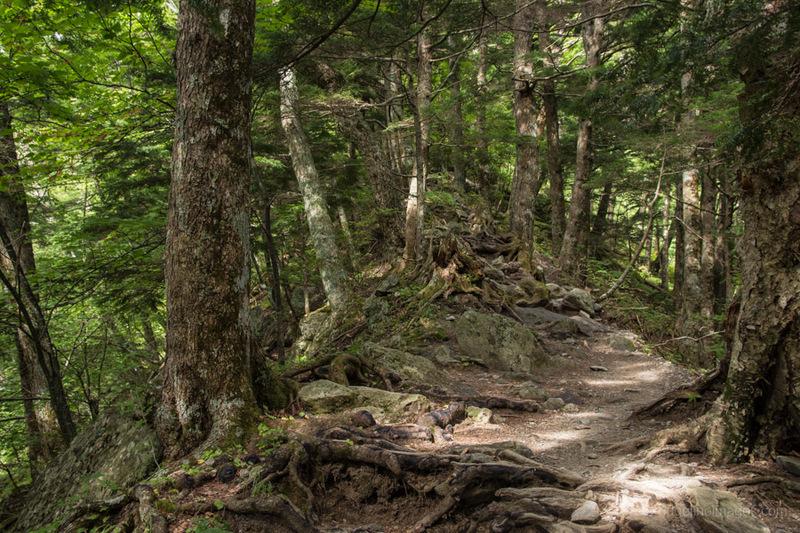 The first 20-minutes of trail follows a gentle incline until you arrive at a trail junction. 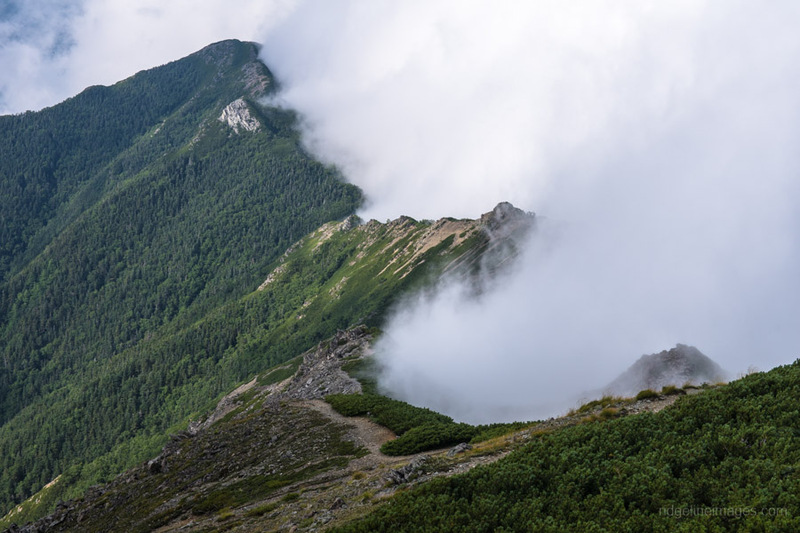 The left-hand trail heads via Okabasawa 大樺沢 which is snow covered much of the year and you’ll require crampons if you attempt this course even in early July. I suggest taking the right-hand trail as it passes the Shirane-oike-koya which has a waterhole and makes for a pleasant lunch stop. From the trail junction to Shirane-oike takes around 2 hours of hard climbing with wooden ladders to cope with eroded areas. Before arriving at the hut, the trail flattens out and passes by a couple of small waterfalls. During weekends expect to find the Shirane-oike-koya bustling with hikers. I did this section of trail on a Sunday in late August and the throngs of climbers made it feel akin to Mt. Takao on a sunny afternoon. After taking a well-deserved rest, the hard climbing continues onwards and upwards to the Mt. Kotaroyama Junction 小太郎尾根分岐. While the map earmarks two and half hours for this section it took me a little under two. The low-lying cloud was pervasive for most of the afternoon but was miraculously stopped in its tracks at the ridgeline. After reaching this point it’s only another 40 minutes to the Kata-no-koya 北岳肩ノ小屋 (campsite 700 yen and water available for 100 yen per litre). While the distance covered on the first day is relatively small the elevation gain is near on 1,500 metres so give yourself a pat on the back. Given the misty surroundings which greeted me upon reaching camp I was doubtful of my chances of seeing Mt. Fuji or any view for that matter. These concerns were slightly allayed with a tinted orange sunset the previous evening, usually a harbinger of fine weather. The strong wind gusts had also done the trick and sure enough apart from some light cloud cover the early morning outlook from my tent was breathtaking. The original plan was to follow Biff Tannen’s advice and make like a tree and get out of here and watch the sunrise from Kita-dake 北岳 (3,193 metres). My chief concern was my tent might do the same in my absence, so I wolfed down breakfast and broke camp. Leaving my pack parked at the hut I made haste for the summit, a 45-minute hike away. 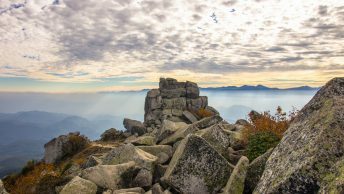 Just before you reach the summit of Kita-dake there is a wonderful vantage point where Mt. Fuji briefly peeks through so look out for it. The views from the summit were equally spectacular even when shared in the company of many. Options from the summit include continuing onto Mt. Ainodake 間ノ岳 (3,189 metres) Japan’s joint third highest peak; skirting around the craggy Happonba-no-koru 八本歯のコル back to the Kata-no-koya or returning the same way as on this hike. If you’re planning to stay the second night at the Shirane-oike-koya 白根御池小屋 (campsite 500 yen) there is a terrific camping spot overlooking the lake on the eastern edge. 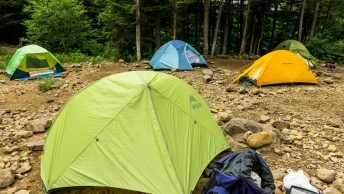 Like the previous evening the wind remained gusty through the night, until I woke up to the sound of rain pitter-pattering on the roof of my tent. Not good as I envisaged the steep trail down to Hirogawara transforming into a preverbal mud slide. Fortunately the rain let up by day break however the damage had already been done. I recommend bringing along trekking poles to help your balance and footing as I should have done. Given the rather treacherous trail conditions it took a good two hours back to the bus stop. Hello there and thanks for all these details about your hike that I am eager to do ! I had a question concerning the campsite, I don’t have any tent, can I rent one on the campingsite ? As a general rule the smaller yama-goya or mountain huts don’t usually rent equipment which is the case with the Kata-no-koya. Though lodging in this hut without any meals (sudomari) is priced at a very reasonable 4,000 yen per person.